Birmingham born, London raised Harlea made quite the entrance last year with her debut tracks Miss Me and You Don’t Get It. High praise came from NME, The Line of Best Fit, Guardian, Dazed and Clash, plus BBC Radio 1 support from Phil Taggart. Both tracks also made Spotify’s New Music Friday playlist, which resulted in over 1.25 million streams on the platform and You Don’t Get It was a Hype Machine top 5. 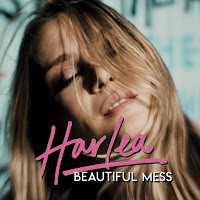 Now Harlea is back with her new single Beautiful Mess which has jumped straight on to Spotify’s New Music Friday playlist (like her previous releases) and is the first release on her own imprint Roxy Princess. Debuted first during her performance at The Great Escape in May, Beautiful Mess is Harlea’s step into the limelight: a stylish, hook filled future classic. It’s produced by American super-producers Rock Mafia who have sold over 50 million records worldwide for artists like Demi Lovato, Miley Cyrus, Selena Gomez, Justin Bieber, Ellie Goulding and the list goes on. The accompanying video for Beautiful Mess was shot in the Californian desert by director Abraham Roofeh and features British poets Robert Montgomery and Greta Bellamacina. There’s much planned for Harlea this summer around the release of Beautiful Mess including further live dates and radio appearances. For more details please visit her website.